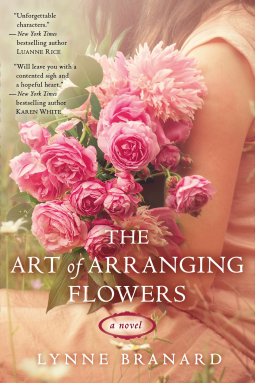 I thought this book was a very detailed, beautiful love story all about a woman in her late thirties named Ruby, who blooms along the way with the beautiful flowers she arranges for the townspeople she loves . The townspeople love her just as much, too, and they do little things for her to show it. Ruby goes so far for them as to add extra special flowers to their floral arrangements to help people along, too, such as a sprig of this to fall in love, or a special twig of that to help them heal, just adding that special touch with flowers to the arrangements to try to help her friends she loves along the way. It's pretty neat how she tucks these in floral arrangements she makes. The people have no clue, but it sets Ruby's heart aflutter to know that just she might be helping them along. Ruby doesn't know what love is like for herself yet. She's denied allowing herself the opportunity to open her heart to anyone because of the loss in her heart for her dear sister who has passed. She still grieves dearly for her and still dedicates her time to visiting her at the cemetery. Ruby feels like everyone she has ever loved in her life has always been taken away from her since the time she was a little girl, and it has. Ruby does not want to open her heart to have another person she does love to be taken away from her again. Ruby is afraid that death will take them. Little does Ruby know it, but along comes a little boy who loses his mother and he ends up teaching her about love, a dying astronaut teaches her what love is like, what it should feel like, what it could be and how wonderful it is to live and to have love, and living life without love is not living life at all. Not only that, but a special someone has done a few arrangements of their own to help Ruby along so she does finally get that chance at love, the love that without question, will last her a lifetime. This truly was a beautiful book to read. I really enjoyed watching Ruby blooming along with her flowers she loves so much when she finally gets that chance at love. You'll be surprised at how it happens, the order it happens in, and the special someone who kind of sets it up for her with a few suggestions for a few people. This is a touching story you will never forget. I highly suggest reading this book. I received this book for FREE from the Publisher, Penguin Group and NetGalley, in exchange to read and write a review about it. "Free" means I was provided with ZERO MONIES to do so, but to enjoy the pure pleasure of reading it and giving my own honest opinion no matter whether it is positive or negative. I am disclosing this information in accordance with the law set here: http://www.access.gpo.gov/nara/cfr/waisidx_03/16cfr255_03.html., The Federal Trade Commission's 16 CFR, Part 255, 16 CFR 255, Guides Concerning the Use of Endorsements and Testimonials in Advertising Federal Acquisition Regulation. My younger 5 Daughters middle names are "Rose". I come here to the post, and there are roses everywhere, and the header. LOL. New GFC follower!